[Source: Jahna Berry and Russ Wiles, Arizona Republic] — Wachovia Corp.’s dueling suitors could have an impact on a $900 million downtown Phoenix development. The bank was in talks with Citigroup, which agreed to acquire Wachovia in a deal valued at more than $2 billion. Wells Fargo & Co. swooped in and announced a more lucrative, $15 billion merger agreement with Wachovia. 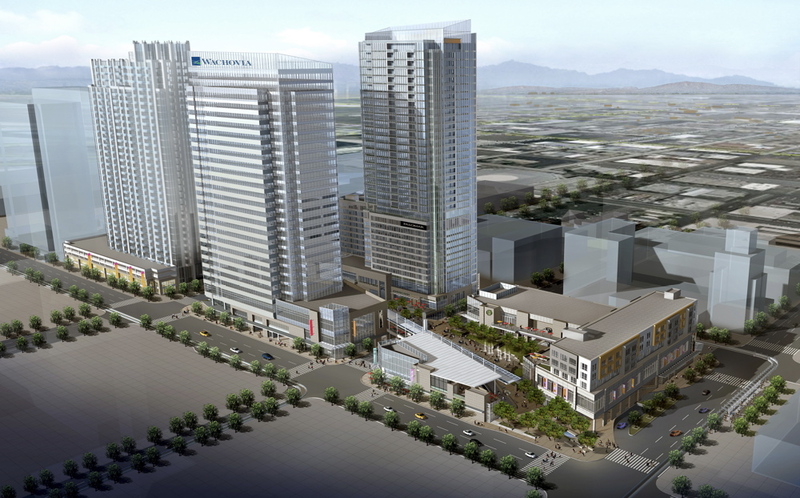 That fight could have a ripple effect on the three-block CityScape project rising in downtown Phoenix. The development includes One East Washington, a 27-story office tower. Wachovia was supposed to be the anchor tenant in 2010, and planned to lease three floors. Historic Preservation staff met with prospective buyers of a vacant warehouse at 515 E. Grant Street on October 3. Development Services, Downtown Development, and Office of Customer Advocacy staff also attended. The buyers are the Stanley Sausage Company, which owns a facility at 2201 E. McDowell Road, but is looking to upgrade to a larger building. The warehouse at 515 E. Grant Street is not listed on either the Phoenix Historic Property Register or the National Register of Historic Places, but is considered eligible for listing; it was built in 1946 for the General Sales Company, was designed by the architectural firm of Lescher & Mahoney and constructed by Del Webb. Representatives of the Stanley Sausage Company indicated that, if they were to purchase the property, they would likely pursue historic designation for the building and request a grant from the City’s Historic Preservation Bond. They are also looking at sites outside of Phoenix to relocate their facilities. 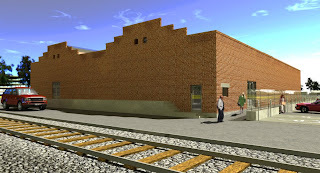 The Historic Preservation Office received a Warehouse and Threatened Building Program grant application from Dudley Ventures (James Howard Jr.) to rehabilitate the one-story 1930 Arizona Hardware Supply Company Warehouse at 22 E. Jackson Street. Because the warehouse’s front façade had previously been stuccoed and the front raised parapet removed, the Historic Preservation Office originally did not consider the building eligible for listing on the Phoenix Historic Property Register, a pre-requisite to apply for a city historic preservation grant. The owner has since removed the stucco from the brick, has provided plans indicating how the salvaged brick from the front parapet can be reinstalled, and has provided architectural drawings demonstrating how the building can be returned to its historic condition and appearance. The vacant 6,600 square foot warehouse will be adaptively used for office use by the owner. The $121,000 grant request will be considered by the Historic Preservation Commission at their October 20, 2008, meeting. The building would need to be listed on the Phoenix Historic Property Register prior to expending any bond dollars for the grant, if the grant application is approved by City Council. Michael Levine, owner of Phoenix Seed and Feed Warehouse, 411 S. 2nd Street, filled a demolition application for the historic warehouse due to difficulties with his lender. Because the property is historically designated, the building cannot be demolished until the one-year stay of demolition expires, and the demolition is subject to an approved replacement plan on the site. [Source: Najat Omer, Arizona Republic] — You may not expect to pay $5 for a cold glass of cold lemonade unless you’re at a ballgame, but at the seventh annual Rainbows Festival last weekend in downtown Phoenix, patrons knew their money would go to a worthy cause. The annual two-day free festival at Heritage Square Park drew about 25,000 people from around the Valley. Organizers said they raised about $40,000 through drink sales and donated the profits to Phoenix Pride, Equality Arizona, and the Community Church of Hope among other organizations, Don Hamill, the festival’s coordinator said. [Source: B. Poole, Tucson Citizen] — Arizona failed to make the top 10 among states in energy efficiency policies, according to one nonprofit group. 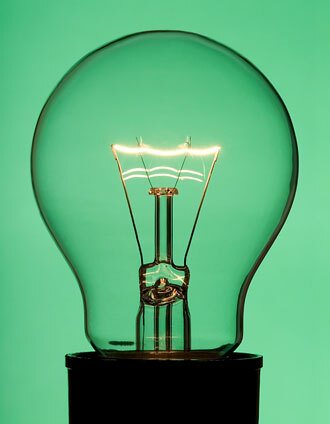 The American Council for an Energy-Efficient Economy ranked the state 23rd based on eight categories, including spending on energy efficiency programs, building codes, tax incentives, and transportation policy, according to its news release. Vermont, Connecticut, and California tied for first on the list, and North Dakota, Wyoming, and Mississippi came in last. Just nine states scored better than 50% out of a possible 44 points in the analysis. Arizona scored 11.5 points. The top three states scored 33 points each. Click here for the full report. [Source: Nate Berg, Planetizen] — In this piece from Citiwire, Jonathan D. Miller argues that infrastructure and the economy are not islands. Improving the nation’s infrastructure, he says, will improve the economy. [Source: Buxton Company] — Over the past few decades, many American cities have lost much of the retail density and diversity that made downtowns and older neighborhoods destinations for shoppers. Retail businesses in downtowns and along commercial corridors in neighborhoods especially suffered from changing retail patterns and shopping habits. Today many cities are actively involved in downtown and neighborhood revitalization activities. They envision healthy downtowns and neighborhoods as integral to their identity, tax base, and sense of community. Strengthening the retail base by attracting new retailers and restaurants has become an accepted strategy for revitalization. During this comprehensive 60-minute webcast, participants will hear how communities are attracting and growing their retail sectors in underserved geographic areas. Click here to register for this free webcast. Once registration is complete you will receive an e-mail with detailed instructions to join the webcast. [Source: Eric English, ABC Channel 15] — The Phoenix City Council voted Tuesday evening to put off a move to alter the traffic patterns of 7th Avenue and 7th Street. The council will seek to study the often confusing ‘reverse traffic lanes’ for another six months. City leaders want to see what impacts the light rail system will have on the downtown traffic flow. The city will, however, move forward with additional signs and lighting for pedestrians at Glenrosa Avenue and 7th Avenue.